Rosemary Nankabirwa would have been 38 this year. A beautiful, driven young woman, she died a year ago this week of adrenocortical carcinoma, or cancer of the adrenal cortex. Caroline Atuhirwe, 29, is fighting throat and lung cancer. She can’t speak and feeds through a tube but she has a radiant smile and can still write and text. Rosemary was in the news a year ago as relatives and friends passed around a hat to raise money to take her to Aga Khan Hospital in Nairobi. The valiant effort to help her came too late. Caroline and her family are looking for $80,000 to take her to a hospital in the United States where they hope surgery and specialised treatment might save her life. Idah Nantaba, 36, is the junior state minister for Lands. I do not know what’s the matter with her but I know that Parliament has approved Shs100 million for her medical treatment, possibly abroad. Rosemary, Caroline and Idah are three young Ugandan women bound together by the inevitability of disease but separated by the peculiarities of poor politics. They are, at once, a collective face of a young nation, and at the same time, the semblance of its vulgar disparities. As a Member of Parliament, Ms Nantaba does not pay tax on her income (a matter we shall return to soon). Caroline does and Rosemary did. So, why does Caroline’s tax money go to pay for Ms Nantaba’s treatment while she and her family have to beg strangers for money? I don’t wish to pick on Ms Nantaba; Defence Minister Crispus Kiyonga is said to be convalescing in a South African hospital and many ministers and other privileged folk routinely have their medical bills picked up by the State. A few years ago the Uganda government admitted, at a retreat of ministers, no less, that it was spending $150 million per year on treating this privileged class, mostly abroad. Yet in 2012 Mulago National Referral Hospital had a total budget of less than $20 million. If, therefore, it is not just a question of money, what could explain this anomaly (assuming, of course, that we agree it is an anomaly)? In October 2003 former MP Aggrey Awori revealed in Parliament that one of the President’s daughter had been flown to Germany in the presidential jet to deliver her baby. In a strong rejoinder, the President said he did not trust local doctors and could not therefore risk his daughter’s life in their hands. The President was right, of course. Sixteen women die every day while giving birth in Uganda (it was higher a decade ago). And he was entitled to do the best for his daughter, as any parent would do – but he did not offer to pay back to the taxpayer what this private journey cost, and has not done so to-date. He saw it as his entitlement, as do many government officials. The list of government officials who don’t trust local doctors has only grown longer. Some local doctors, having since set up their own private hospitals, have since become a tad more acceptable to treat the odd bruise and cold, but you have not lived in power in Uganda if you don’t die in Morningside Hospital in Johannesburg or the Aga Khan Hospital in Nairobi. Ironically, there is a high likelihood that if you will be seen by a Ugandan doctor in Kenya or South Africa, one of the many who fled the country under the Amin dictatorship and have found no reason to return home. 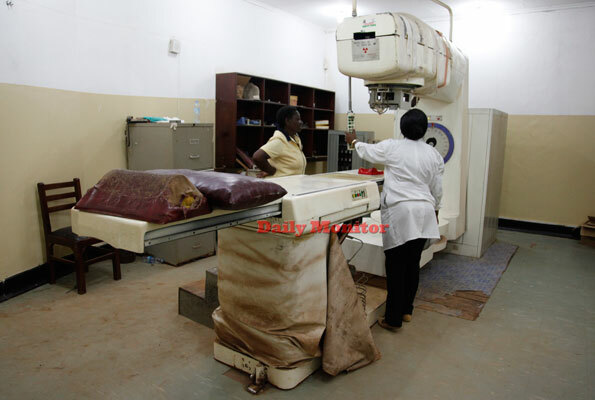 The current debate on the Uganda Cancer Institute is a symptom of many bigger problems. It is the symptom of our failure to invest in facilities, yes, but it speaks a lot about the ‘arrivalism’ of the political class. Wasn’t the President at the forefront of the openness campaign against HIV/Aids? Isn’t Uganda still credited with dealing with successive Ebola epidemics with minimum casualties? So why do we export our doctors, pay those who remain poorly, and invest more in equipment that kills than in that which heals? The short answer is that over time, Caroline and others like you and me have become tenants in Uganda. State capture means that the country now has its owners, the landlords. If you are lucky and catch their eye, they might throw some money your way, for treatment or to have your remains returned, the way bank robbers will throw some notes in the air as they get away. Those who dare defiance are resisted and run over. Desperate and stripped of pride, many Ugandans have become victims of their nationality, reduced to begging for alms rather than demanding for their rights. Last year it was Rosemary. Today it’s Caroline. Tomorrow it’ll be someone you know. Forget #SaveMulago; it is Uganda that needs saving. Good observations. But where to we start to save our own country? Banange This is such a true & tragic reality of healthcare in our Ug. if we can call it that. Too annoying & sad it’s absurd! We need a glimpse of hope! Our Moses if you are out there! Perhaps start with campaigning for wealthy so called investors to stop overcrowding our country with new hotel resorts, golf courses and real estate for the elite, without mandating that a percentage of their projects goes towards old infrastructure that already exists and needs investing in eg why do millionaires like sudil that have received so much already, want to acquire more land for so called new hospital when our old hospitals are crying out for help and investment? A little philanthropy would do us good. How many Ugandans can afford golf course and expensive hotel resort lifestyles when eg doctors & university lecturers will cannot live on what they earn?